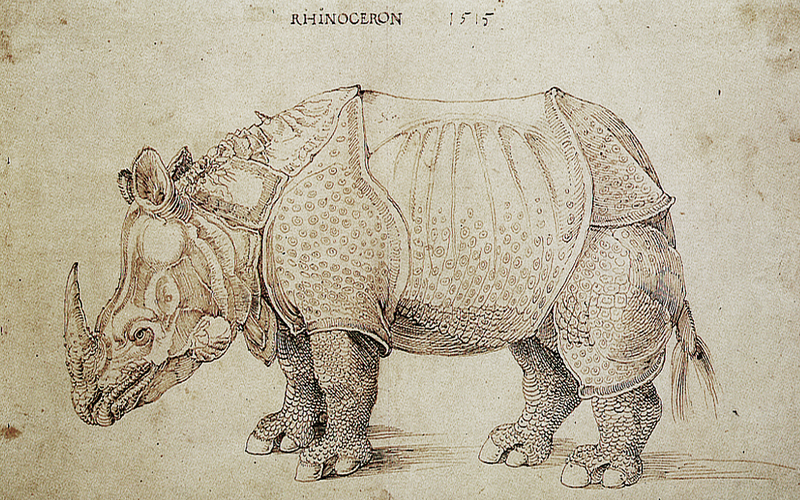 To kick off the new year, I want to examine Dürer's rhinoceros, which was created 500 years ago, in 1515. It began as a drawing (now in the British museum), and was then rendered a print and widely distributed. 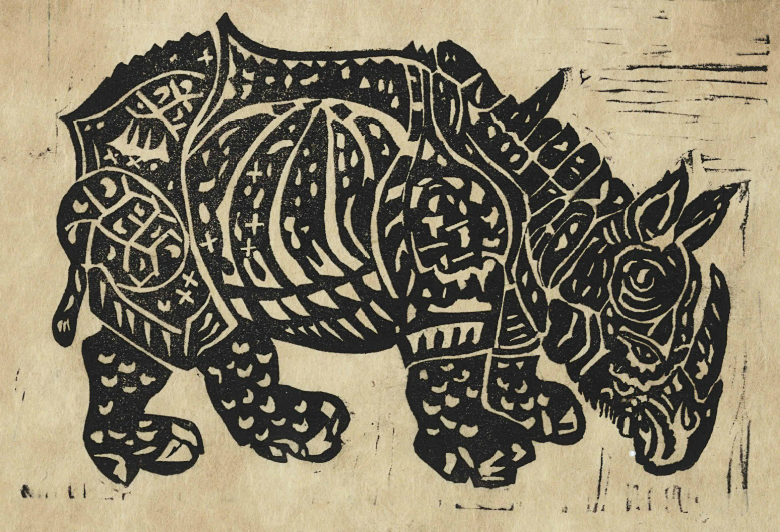 Indeed, it was among the most successful prints of the time, and it fixed a conceptualization of the rhinoceros in the European imagination for the next few centuries. It was created at the height of the high renaissance. This was also an age of imperialism and discovery. Battles were waging for control of Europe, Christianity was dividing, and new territories were being conquered across the globe. Dürer's rhinoceros reminds us that the renaissance was a time of upheaval and expansion: European powers were fomenting global aspirations. Those efforts recruited the talents of artists. Artists were called on to glorify European imperial power and to present the untamed allure of foreign shores. At the same moment, a new notion of art was emerging, one that remains with us to this day. Dürer's celebrated beast can help us see a link between art and empire. Dürer never saw a rhinoceros. There had been none in Europe since Roman times. That changed in 1515 when an Indian rhinoceros was brought to Lisbon and put on display. It attracted crowds for several months before being shipped off to Rome in 1516 where it was intended as a gift to Pope Louis X (see Raphael's portrait on the left). The boat never made it. Crashing off the shores of Italy, the rhino, whose legs were chained to the deck, died along with the crew. Its carcass was soon recovered, stuffed, and delivered to the Pope. It then disappeared. Shortly after its arrival in Lisbon, a drawing of the rhino (now lost) arrived in Nuremberg, the birthplace and home of Albrecht Dürer. Dürer sketched the animal (below) and, with the help of his assistants, made a print. Now 44, the artist was at the peak of his powers, and he was one of the principle artists working for Emperor Maxmilian I. His acquaintances include major figures of the renaissance: Michelangelo, Raphael, Giovanni Bellini, and perhaps da Vinci. He also met Martin Luther and Erasmus. Dürer's work was widely known and distributed. Though cherished as a painter, he preferred printmaking. Prints would sell for the price of a meal, making them affordable to all, and lucrative for their creators. Dürer's wood blocks were sold throughout Western Europe and often imitated (he fought lawsuits to stop forgers and plagiarists, and, while in Venice, he feared being poisoned by rivals). Dürer's rhinoceros print was a colossal success. It sold up to 5,000 copies during his lifetime, and it was widely copied. As early as 1516, a small cartoonish copy appeared in to a map of the world (below). 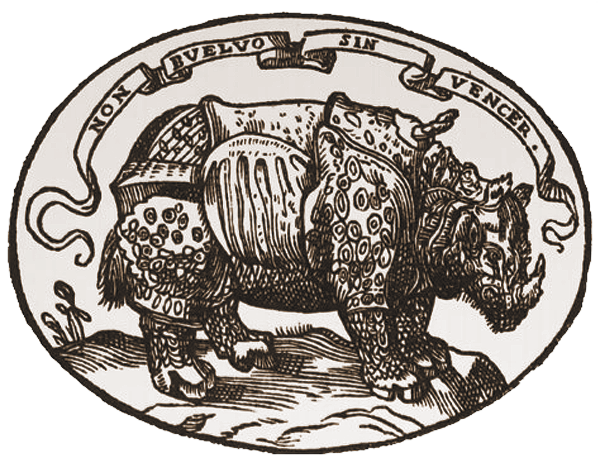 Dürer's rhino soon found its way into paintings, encyclopedias, and even a Medici seal (below). And this drawing from 1684 by the English artist, Francis Barlow, shows Dürer's rhinoceros fighting an elephant. Such battles are described with great relish in the text that adjoins Dürer's original print. We even find Dürer's beast in a 1738 painting, Les Nouvelle Indes, by Frenchman, Alexandre-François Desportes. Such images testify both to the longevity of Dürer's image, and to its wide international dissemination. 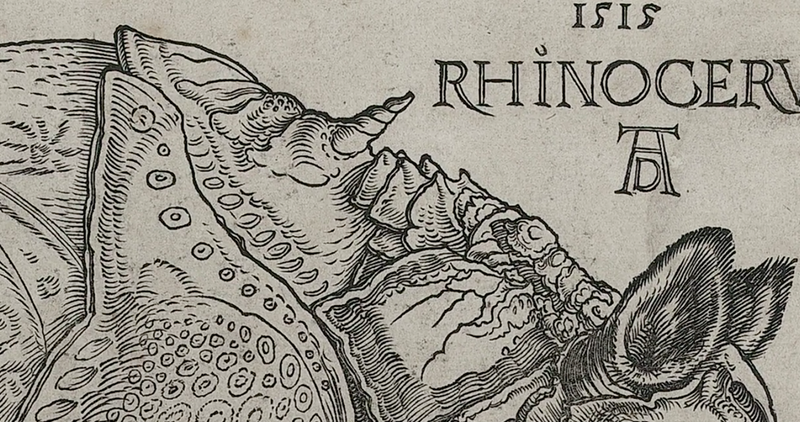 Dürer's influence on European conceptions of the rhino does finally wane, however, in the 18th century. For example, his version is explicitly challenged by Balthazar Lakeman in 1727. 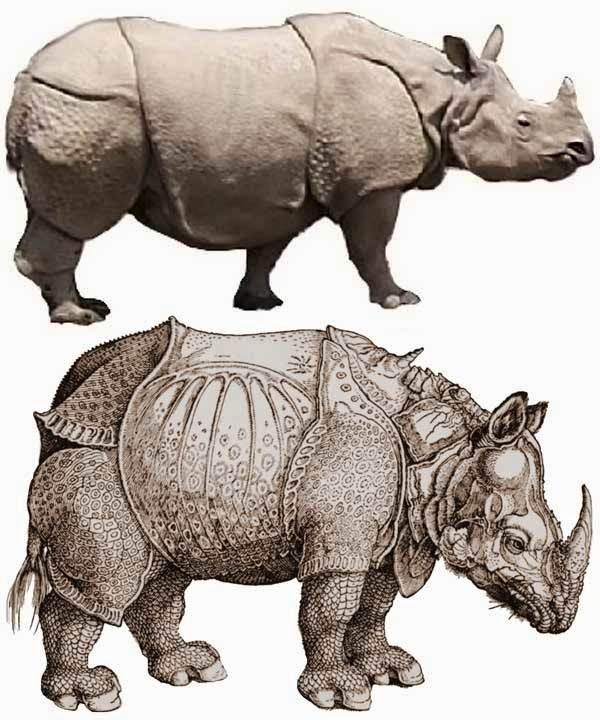 Based on a detailed description of an African rhinoceros Lakeman published a comparative illustration, showing how "normal" depictions of rhinos (i.e., depictions based on Dürer) looked compared to his more faithful depiction. After Clara, images of rhinoceros began to change in Europe, but Dürer continued to exert an influence. 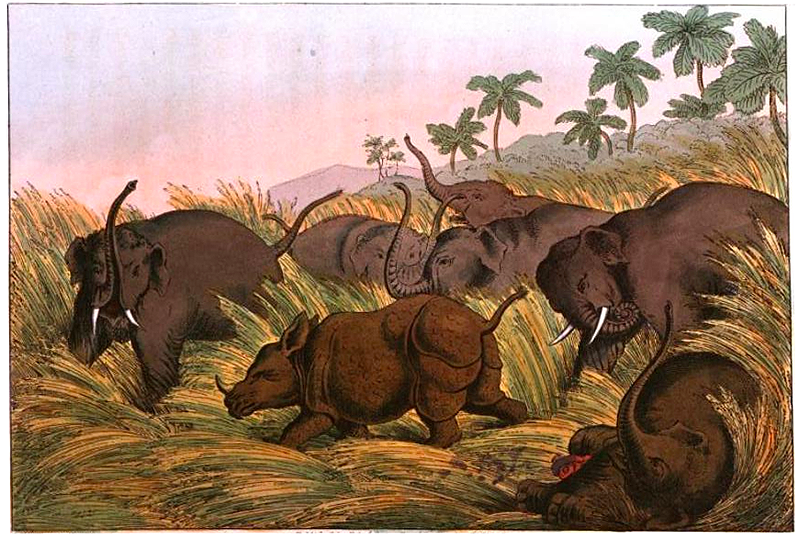 For example, the theme of rhinos fighting elephants continued to fascinate. A English book from 1807 on "Oriental Field Sports" dedicates much of a chapter to such violent encounters, indicating that they are only confirmed by hearsay. 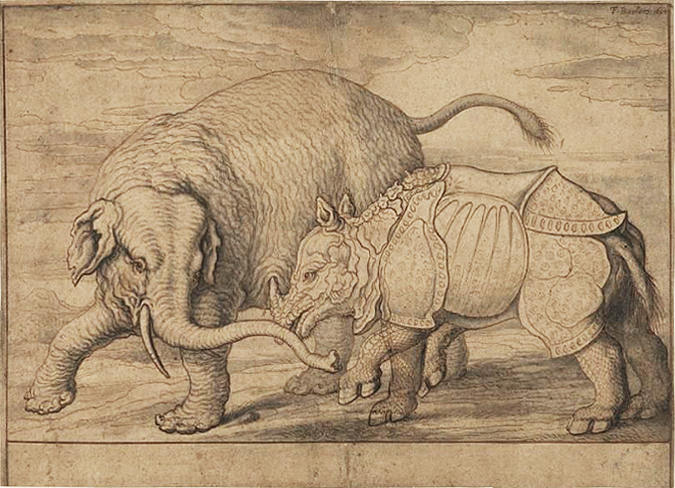 The author includes a fanciful image by Samuel Howitt, in which a rhino audaciously attacks five elephants; the rhino looks like Clara, but the them evokes Dürer's text. The fame of Dürer's print was not diminished by the arrival of captive rhinos or more accurate portrayals. Indeed Dürer's image has remained one of the most treasured animal portraits in the history of Western art--perhaps the most famous of all. It is universally recognized and highly valued. A copy recently sold for $866,500 at Christie's, breaking all previous records of Dürer prints by a considerable margin. The enduring authority and impact of Dürer's image in surprising. His depiction is inaccurate in many respects. Most obviously, he has covered the animal's skin into a constellation of armor-like plates. 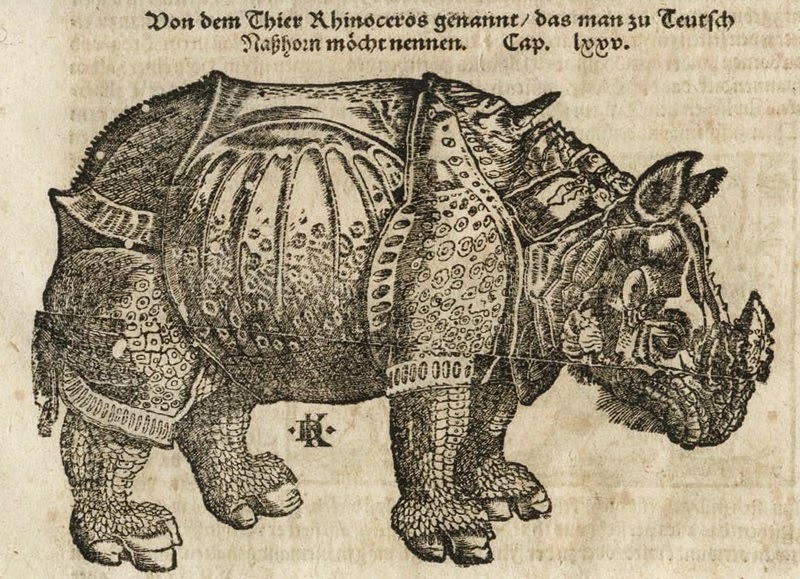 The plates on Dürer's rhino have cytological patterns and striped fringes, which seem more aesthetic than functional. Indian rhinos do have some markings on their skin (above), but Durer has converted these into something more like a printed textile or chain-mail armor. 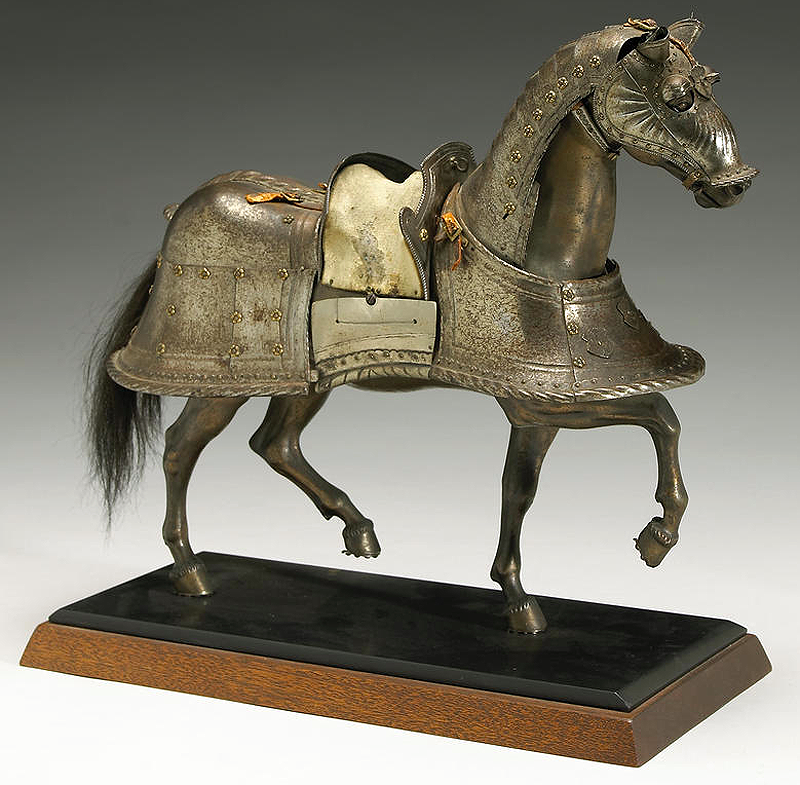 Indeed, the overall affect closely resembles the the armor (or "barding") used by military horses in Dürer's day (below). The central plate on Dürer's rhinoceros has a motif that fans outward from the top, and ends in a neatly arranged pleat along the belly; this pattern is sometimes referred to as a dragon stripe, but it also resembles patterns found on armor (see the muzzle in the horse barding above). A plate on the posterior extends into a triangular point, which evokes a tortoise shell, or, again, the body armor on a horse. There is even a faint suggestion of a saddle on the rhino's back. The animal's face is a curious network of textures, and concentric sheets extend from its cheeks, culminating in a pair of leaf-like forms that hang like an exotic necklace. The nose and lips of the rhino are curiously scaly, and scales also cover its four sturdy legs. Strangest of all is a plate that sits on the animal's back, just above the fin-like projection that crowns its shoulder. The back plate hosts a diminutive spiraling horn, which complements the grand horn that sits upon its snout. Granted, some rhino species have two horns, but Indian rhinos do not, and none have horns on the back. Careful attention also reveals a row of small spikes--like a punk rock bracelet--leading up from the menacing main horn, back towards the smaller horn, interrupted by a sheath of vertebrae that protect the upper neck. This creature is part animal part war machine. Its decorative carapace anticipates contemporary images of futuristic robots designed for battle. The text atop the print explains that, despite an affable personality, this beast is a fearsome warrior. We are told that elephants are defenseless against it. The source of these inaccuracies is unclear. 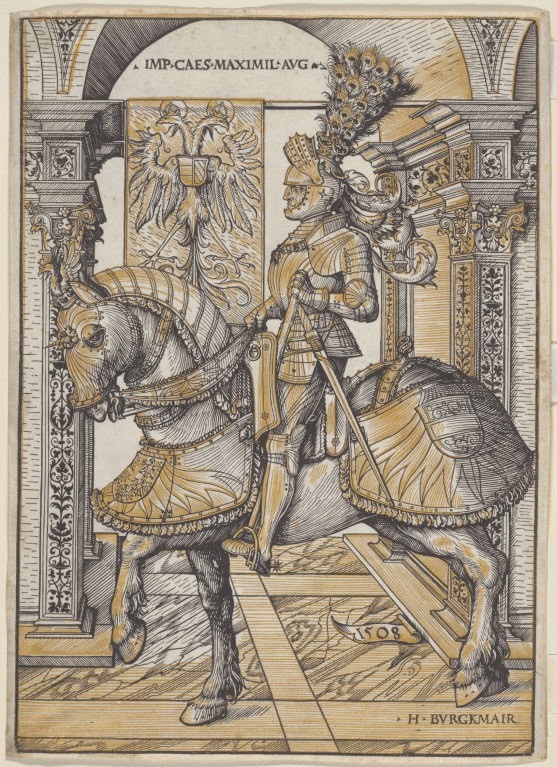 Dürer may have based his image on a poorly executed drawing that invites an armor-like interpretation, but many details are clearly artistic embellishments, including the second horn. 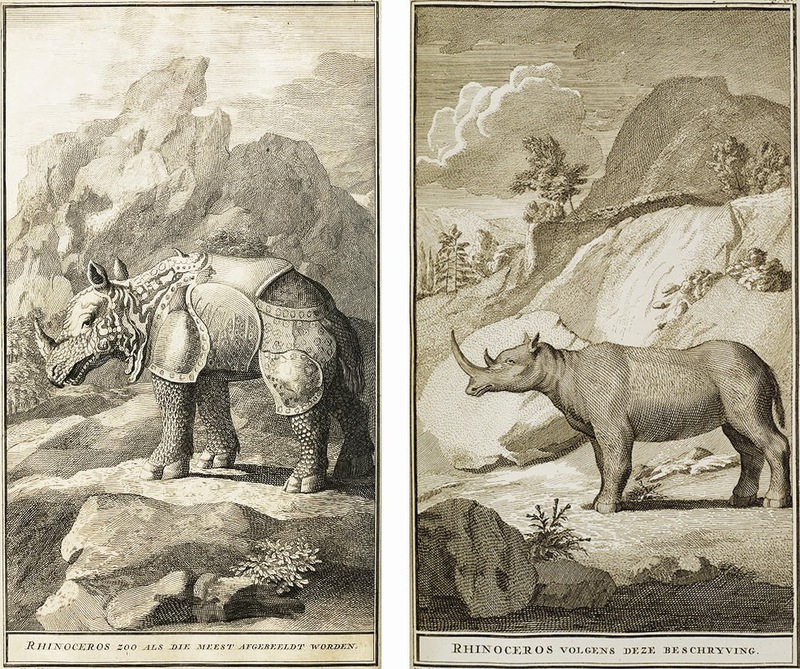 This embellishment story gains support from the fact that an alternative rhinoceros drawing was produced by another leading artist in Maximilian's court, Hans Burgkmair. His version is more accurate in every respect (above). The legs are wrinkled, not scaled; the plates of skin are textured, but not neatly gridded or fringed; the head has a uniform texture, and the neck has folds of flesh rather than a necklace of geometrical projections; the upper neck has short tufts of hair, rather than a second horn. Burgkmair has also included a chained rope around the animal's forelegs, indicating that the creature was drawn in captivity, not in the wild. There are also striking similarities between the Dürer and the Burgkmair: their proportions; their hoof nails and leg configuration; the arrangement of the plates; the ears, tail, and whiskers; even the way in which the ground swells in the background. The images were created around the same time from the same source image. At least one of the artists had clearly seen the rendering of the other. It is tempting to speculate that Burgkmair's came first, given its greater accuracy, and Dürer then took significant artistic liberties for his version, as if to render the creature more exotic, and more bizarre. This augmentation of reality may also help to explain the comparative success of Dürer's image. Burgkmair was a well-known artist at the time, but he was more of a naturalist. Dürer's style implies clinical precision, but he regularly exaggerates and idealizes. In Art and Illusion, Ernst Gombrich uses this example to challenge the view that artworks are mere imitations of nature. Artists do not simply copy what they see; they use their ideas and ideals to render reality into a form that will be intelligible and palatable to viewers of the time. 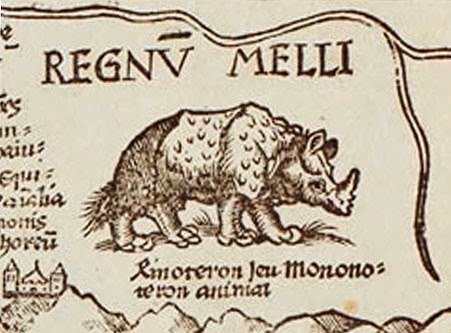 Dürer has transformed the rhinoceros into a renaissance knight (see Burgkmair's depiction of Maximilian I, above, for comparison). I think Gombrich is right about this, but there is more to the story. Dürer is not just making his creature recognizable, by superimposing contemporary armor; he is at the same time making the creature more alien and more threatening, since no animal in Europe looks anything like that. In so doing, Dürer is both constructing a notion of the exotic, and he is enacting a newly emerging conception of the function of art. 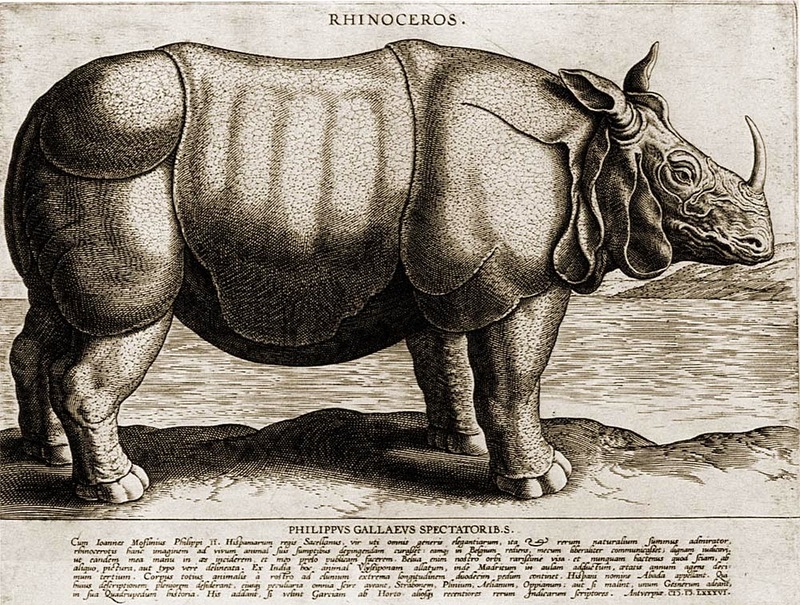 To better appreciate Dürer's motivation in making his rhino exotic, it is useful to return to the story about how the animal came to Europe in the first place. 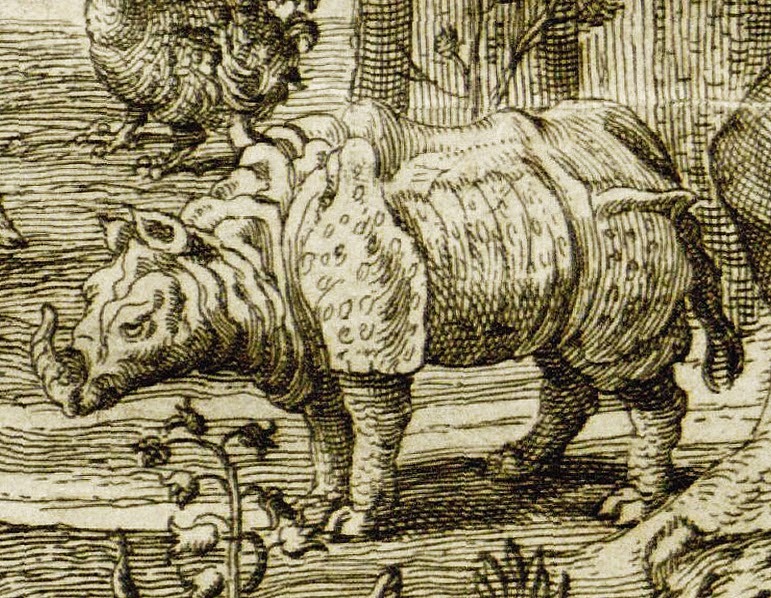 How, one might wonder, did an Indian rhinoceros end up in Portugal in 1514? Portugal was a major sea power at the time, and its explorations had moved from the Atlantic into the Indian Ocean. In 1510, Portugal captured the Indian port of Goa, on the southwest coast, and it set up a colony there, which would remain under Portuguese control control until 1961, when Indian forces invaded. A year before the conquest of Goa, the Portuguese sought to capture a strategically located island in the north called Diu, with the help of Egypt, Dubrovnik, Turkey, and Venice. The plan failed. In 1513, a second unsuccessful attempt was made. 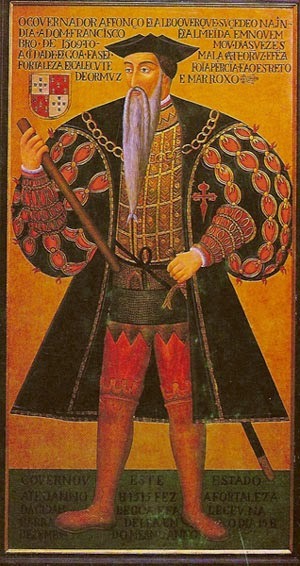 In 1514, The Portuguese governor in Goa, Alfonso de Albuquerque (above, left), tried to negotiate with Sultan Muzafer II, who controlled India's northwest coast. They wanted to open a fort in Diu. The Sultan refused, but in an diplomatic exchange of gifts, he offered Alfonso an Indian rhinoceros. Embarrassed at his failure to secure Diu, Alfonse sent the animal on a four month journey to Lisbon, as a consolation gift to Manuel I, King of Portugal (above, right). Manuel I evidently appreciated the gesture, and was undoubtedly impressed by the attention his new pet received. But he decided to part with the creature, in the hope that he could win favor with Pope Louis X in Rome. The Pope had earlier received a white Indian elephant, whom he adored, and Manuel I presumed that he would delight in a new addition to his papal menagerie. Pleasing the Pope might win his favor during heated border disputes with Spain. His failed effort to expand borders in India might be compensated by propitious shift in borders at home. The gambit to win papal favor was not successful, however. First, the ill-fated rhinoceros died in transit. Then the Pope fell on hard times. France had invaded Rome the year before, and ongoing battle ensued, aided by precarious alliances with England and Spain. There were also a number of major religious upheavals. There was an Ottoman threat from the east, and a charismatic leader of a Christian cult had entered Rome and denounced the Pope and his key cardinals. 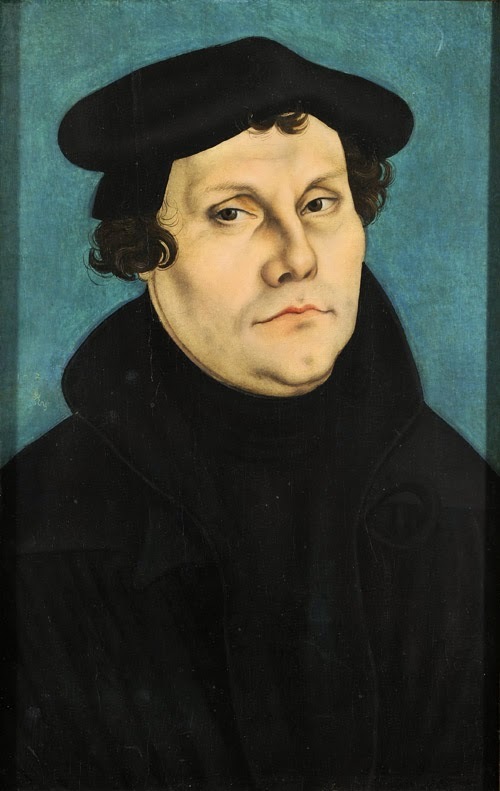 One year later, in 1517, Martin Luther (painted by Cranach the Elder, right) published a tome that would incite the Protestant reformation. 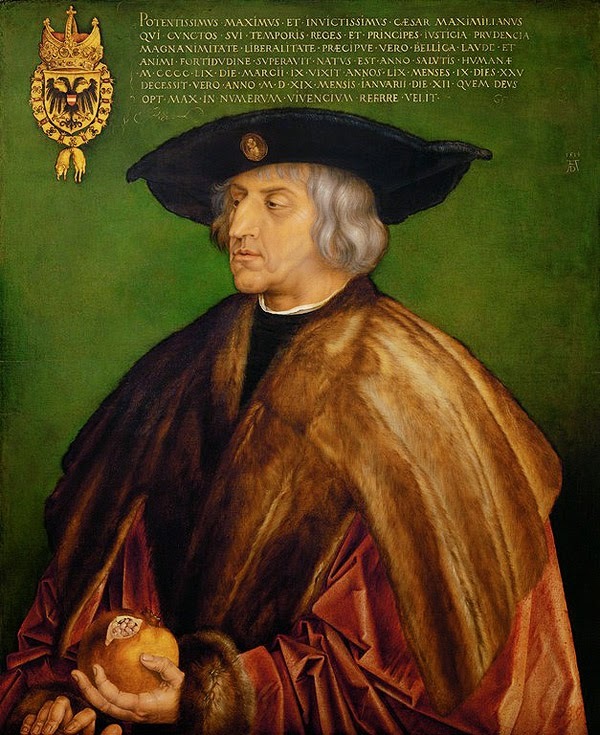 Shortly thereafter, in 1519, Dürer's patron, Maximilian I, would die, and the Holy Roman Empire would come into the hands of Maximilian's grandson, Charles V (his mother was next is line, but she was both female and deemed to be insane). 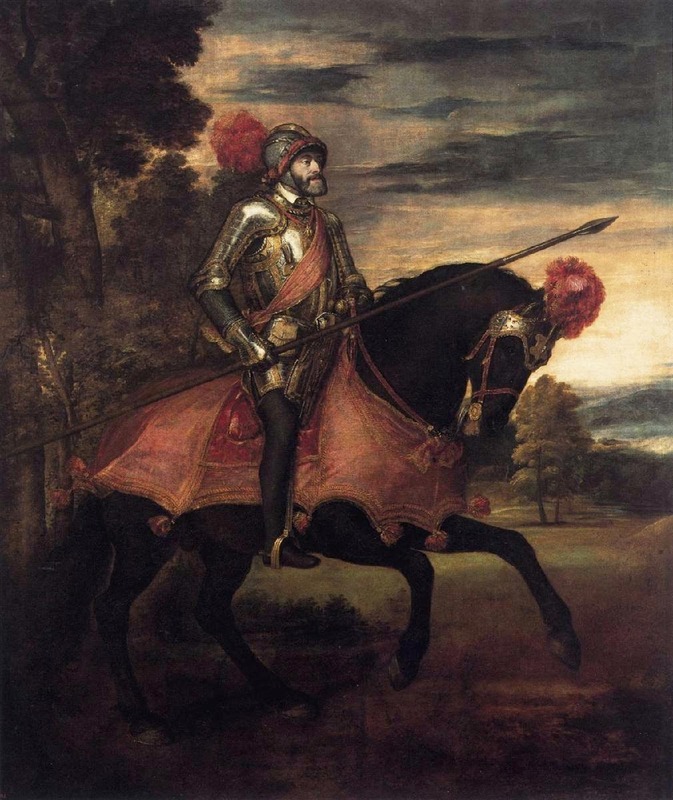 Charles V (depicted by Titian, left) went on to wage costly wars against the Protestants, but, when he failed to pay his soldiers, they decided to sack Rome. This happened in 1527--a year before Dürer's death. As a result, the Pope (Louis's successor) became a puppet of the Holy Roman Empire, which has once done the Pope's bidding, and the Holy Roman Empire began to split, because some of its territories became Protestant; Dürer himself became a devotee of Luther. These events set the stage for the 30-Years War, one of the most devastating conflicts in human history. 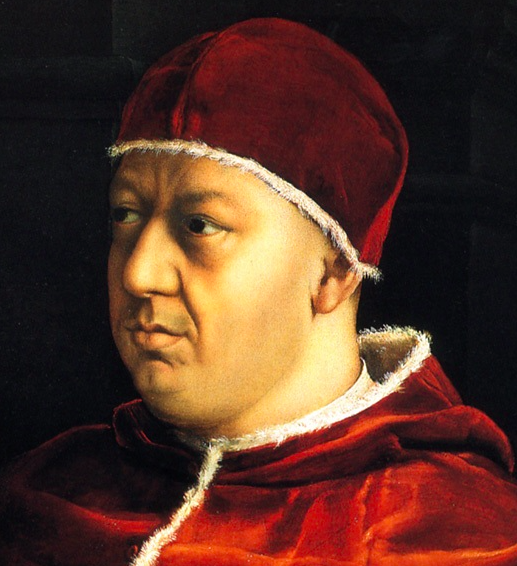 That war began a century after the stuffed rhinoceros was delivered to the Pope Leo X, but the events that destabilized his papacy were indicative of trends that would lead toward that end. European powers were competing for control both within Europe and beyond. The rhino arrived at the epicenter of these conflicts, and its disappearance is likely a consequence of the ensuing instability (compounded by the poor quality taxidermy that was practiced at the time). There is no record of its presence there. 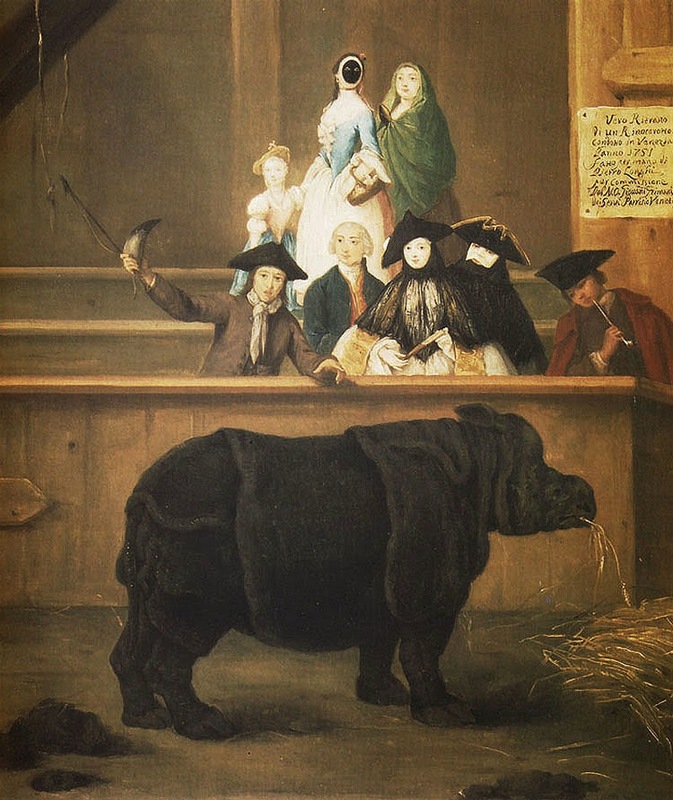 There is, however, one depiction of a rhino in the Vatican created during this time period. It appears in Raphael's painting of God creating the animals (above). 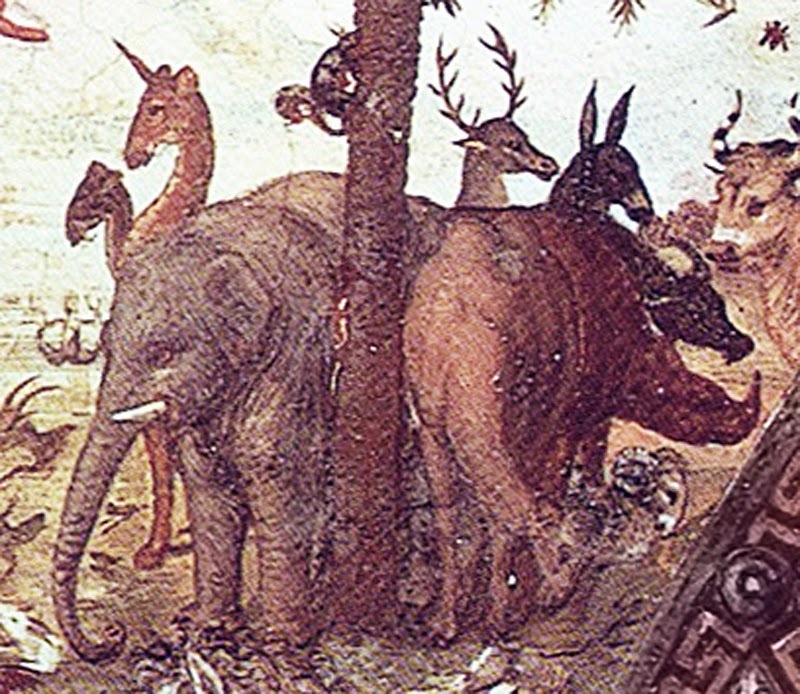 Raphael's rhino appears in a cluster of animals that includes the Pope's elephant, a camel, a squirrel, and a fanciful giraffe. 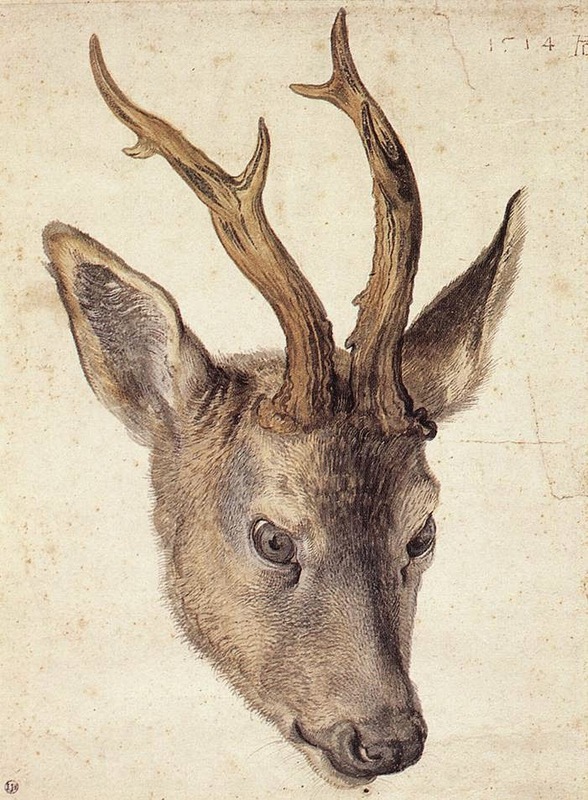 It looks strikingly more naturalistic than Dürer's (see detail below). It lacks the speckled side plates, and geometric necklace. It also seems to lack the extra horn. Perhaps Raphael saw the stuffed original. If we situate Dürer's depiction in the social context that I have been describing, several things become immediately apparent. First, he was employed by the Holy Roman Emperor, a chief player in the bid to control Europe (see his portrait of Maximilian I, below). Depicting the rhinoceros as a mighty, armored war machine, fit with his mandate to portray empirical strength. Second, the beast was itself a consequence of European imperialism. The ability to visually capture a foreign creature was a symbolic stand-in for imperial conquest itself. Europeans who bought the image could revel in their conquest of distant lands. Portugal was not part of the Holy Roman Empire, but it was an ally, and Portuguese conquests in India could be embraced as an advance for all of Europe. The Americas were being divided up by European powers at the same time. Third, by presenting the rhinoceros as radically different from European animals, Dürer was able to both express and influence the idea that Asia was an exotic place. As with later orientalist trends in Western art, the exotic served to make Asia both seductive and incommensurably foreign. Similar attitudes were fostered towards Africa and the Americas. Exoticism was used to encourage colonial expansion. The world outside Europe was abounding with natural and human-made treasures, but also dangerous, unenlightened, and savage--in need of Europe's civilizing force. 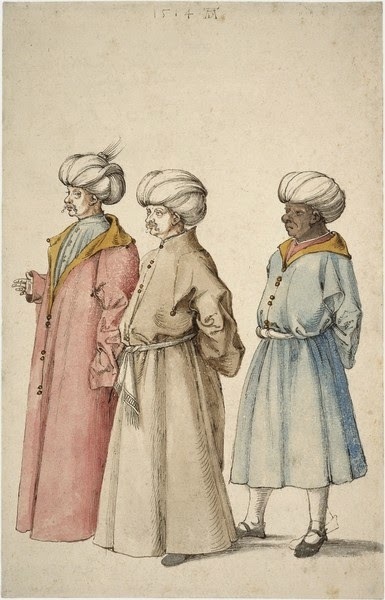 A year before he drew the rhinoceros, Dürer sketched the picture of two Turks (below, left). The figure standing behind them is a slave, perhaps from Africa. 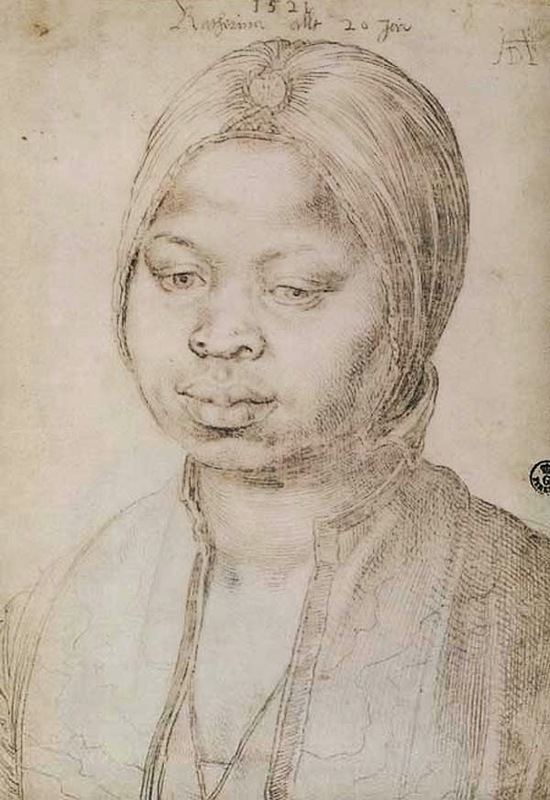 In 1521, Dürer sketched another African slave named Katharina (below right), who was owned by one of Manuel I's representatives in Antwerp. There is great dignity in this portrait, but it is also a reminder that Dürer was living in a time when European expansion was opening up new possibilities for extreme exploitation. His work reflects these changes without any overt critical commentary. Such images help to construct new notions of Europe's place in the expanding world. All the days of my life I have seen nothing that rejoiced my heart so much as these things, for I saw amongst them wonderful works of art, and I marvelled at the subtle Ingenia of men in foreign lands. In the same period, European countries were setting up colonies in South America, Africa, and the Middle East. 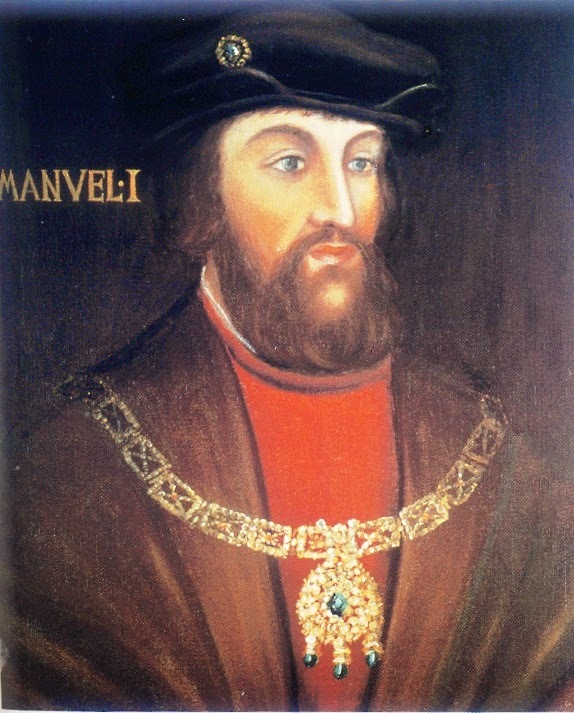 King Manuel I, who established the Portuguese colony in India, was also in power when Portugal discovered Brazil. A man of deep faith, he funded the work of missionaries who were being sent to remote reaches to spread Christianity. In addition, he issued the edict that demanded the conversion of Portuguese Jews, leading to the Inquisition. Manuel I also played a role in establishing chattel slavery. The transatlantic slave trade was operating by 1502. In choosing to depict the rhinoceros as a quasi-mythical beast, Dürer was doing the bidding of the expanding European empires. His distortions are almost certainly intentional. They systematically depart from presumed source materials in ways that exaggerate the oddity of the animal. It is interesting to contrast his rhinoceros with his earlier depictions of a hare, squirrels, and a beetle (above), which show nearly unprecedented sensitivity to animal anatomy. Dürer was capable of accuracy in depicting the natural world, but he was also fond of fantasy, as the dragons and griffins in his prints attest (below). He chose to place his rhinoceros in this otherworldly realm, and that decision accords with the colonial project. But Dürer had another motivation as well, and this brings us to the topic of art. Before the renaissance, European art primarily served ecclesiastical functions. With secularization, questions about the function of art inevitably arose. Art had already been a commodity. Those with means could buy lavishly illustrated books of hours, for example. With the renaissance, people with wealth could also commission portraits, or buy religiously themed work for their homes. But the renaissance also made art accessible to those who were not in a position to pay large sums to painters. Two developments fostered this democratization: one was advances in printing technology, which allowed artworks to be reproduced in large quantities. The other was the development of places for viewing art outside of religious contexts. 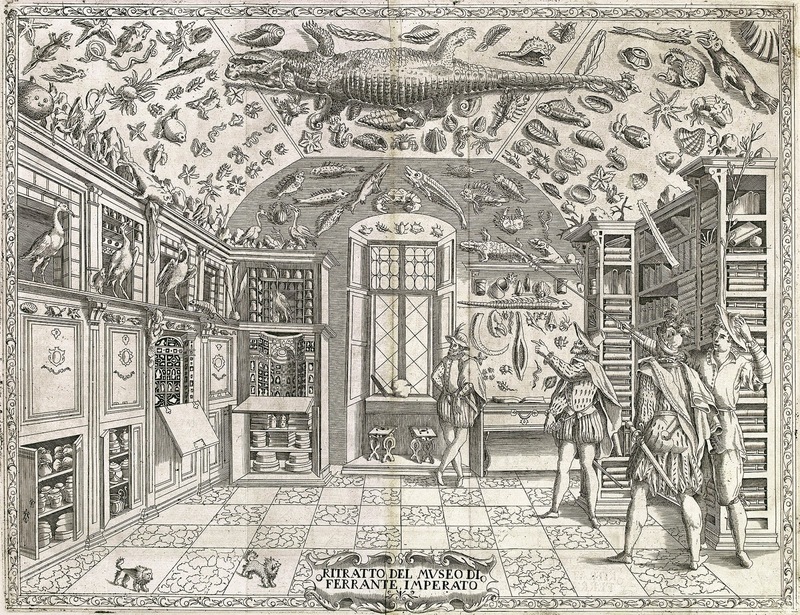 In the 16th century, cabinets of curiosity became immensely popular, and large collections were amassed, which were viewed by the public (though perhaps still restricted to the middle classes). Dürer was actively involved in both of these developments. He was an avid printmaker and an avid collector. Dürer's interest in printmaking was almost inevitable. His home of Nuremberg was one of the printmaking capitals of Europe (along with Venice, where he briefly resided). His family lived down the street from Anton Koberger, the most successful printer at the time. Koberger was not merely a neighbor; he was a close friend of the family and Dürer's godfather. 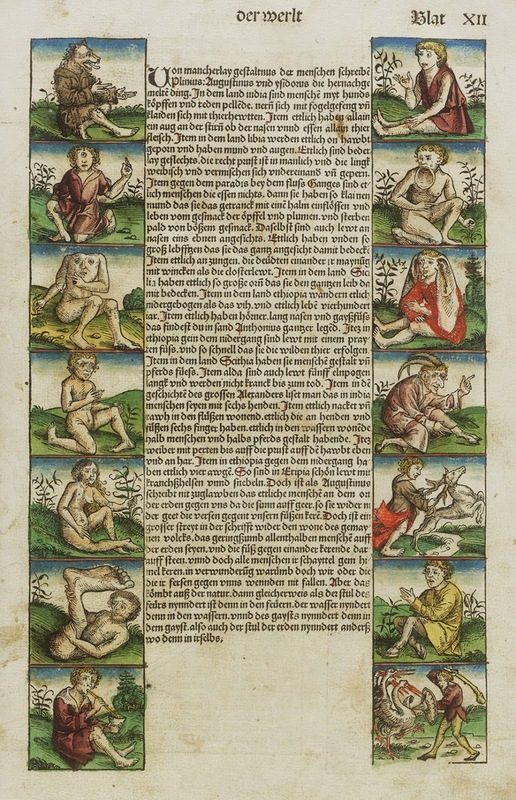 His fame arose in part because he was the printer of the Nuremberg Chronicle, a compendious history of the world, told through a Biblical lens. The lavishly illustrated volume was immensely popular, it represents a transition from the age of exhorbitantly expensive illuminations to secular art, available to the masses. It is also an interesting document in light of European expansion. 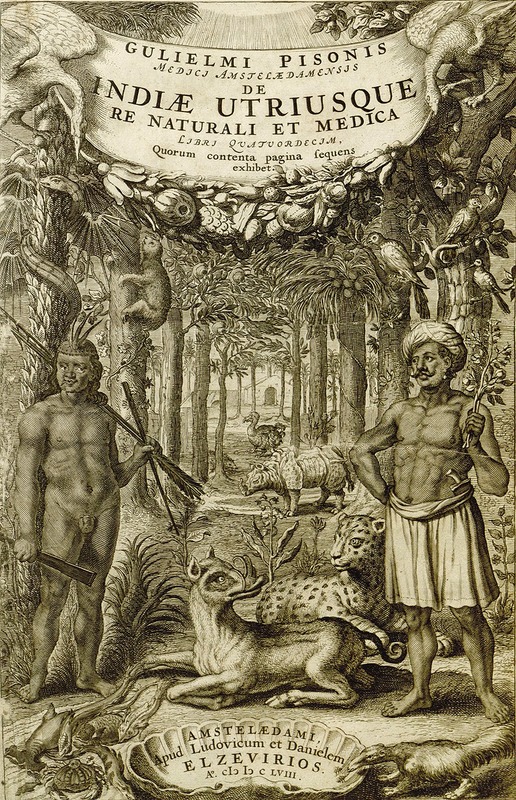 While focusing on Europe, the book also presents information about other parts of the world, including a catalogue of human oddities found across the globe (right). Dürer would have been familiar with these images and descriptions. They contributed to an emerging sense of the monstrous "other." Dürer's own printmaking practice can be seen as a continuation of the Nuremberg Chronicle. His prints are populated with secularized biblical themes and fantastic creatures designed to amaze and delight. Judicae Rodrigo gave me 6 large Indian coconuts, a very fine stem of coral, and 2 large Portuguese florins. In return for the 3 books which I gave him, Herr Lazarus von Ravensburg has given me a great fish-scale, 5 snail-shells, 4 medals of silver, 5 of copper, 2 little dried fishes, a white coral, 4 cane-arrows, and another white coral. I gave the new carrier ( Vicarius) the great turtle shell, the fish-shield, the long pipe, the long weapon, the fish-fins, and the two little casks of lemons and capers to take home for me. I have given 1 florin for a little ivory skull, and 1 white pfennig for a turned box. I paid 3 stivers for twp buffalo horns and 1 stiver for a two Eulenspiegels [trickster figures]. These are precisely the sort of items that would have been presented in a cabinet of curiosities. One can presume that Dürer had such a cabinet, though it is not clear whether he shared it with anyone other than close friends. It is known that he sometimes gave horns as gifts, that at least one friend coveted items in his collections, and that he sold a trove of curios to Charles V, when he became Holy Roman Emperor. Cabinets of curiosity (see example above) reflect the core theme we have been considering here: a fascination with the exotic, fueled by and conducive to an expanding European empire. Coconuts, ivories, buffalo horns, and foreign weapons all reflected access to distant lands. By displaying such things, one should oneself to be worldly, and, at the same time, endorsed the global expeditions that allowed such items to be collected. Such expeditions were often linked to colonialism, and as an artist on the Imperial payroll, Dürer was part of the system that ushered in this new world order. Dürer's cabinet of curiosities also reflects the new conception of art, to which I eluded. Such cabinets were precursors to the modern museum concept. They were places where ordinary people could go to look at objects for the mere pleasure of beholding them. 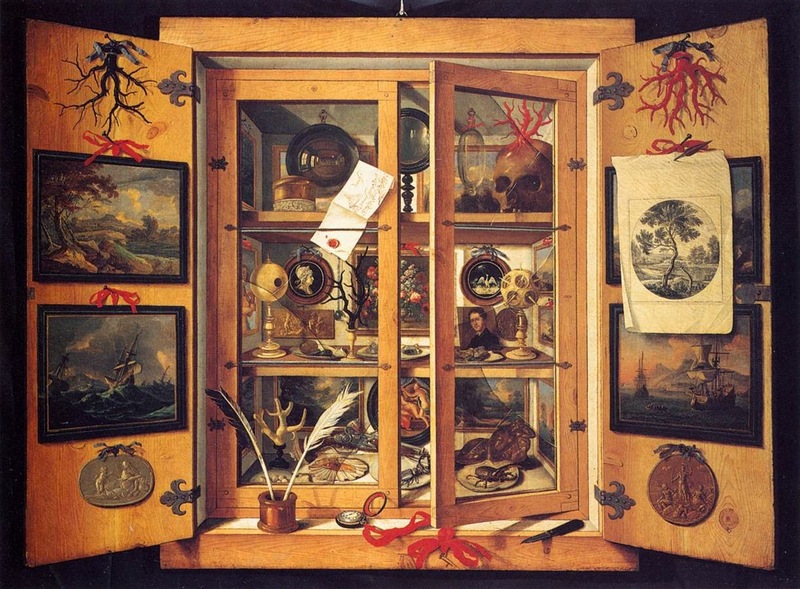 Unlike modern museums, which are functionally divided into art museums and natural history museums, cabinets of curiosity were a mix of naturalia and artificialia. They combined functional artifacts with dazzling minerals, animal specimens, antiques, and things we might now recognize as artworks (e.g., European paintings and sculpture). 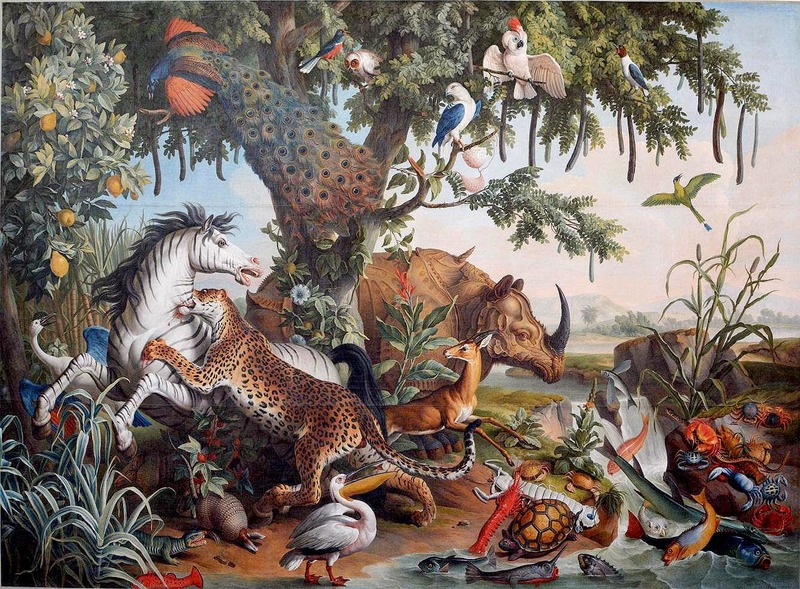 A 17th century example, mixes paintings with natural curiosities, is reproduced below. Such assemblies might seem incongruous to modern viewers, but they were united in the renaissance mind by their capacity to induce wonder. For Dürer, horns and fish scales were objects of wonder, and they deserved a place along side the kinds of objects he was in the business of creating. From this perspective, it is easy to see why the rhinoceros would have appealed to Dürer, and why he would have depicted it as he did. The rhinoceros was a curiosity par excellence. It was an object of wonder imported from mysterious foreign lands. The thrill of beholding such a beast was akin to the thrill of seeing art: beautiful, intriguing, inexplicable, marvelous. 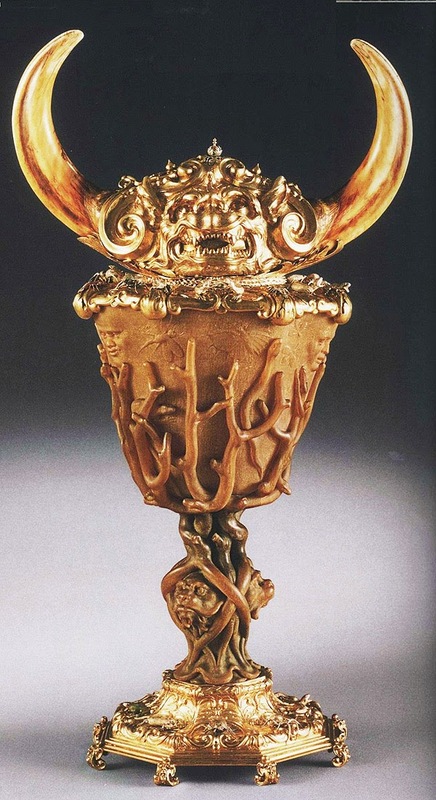 (Compare the 1611 goblet on the left, which is made with a rhino horn). By depicting the rhinoceros as a frightening, armor-clad, monster, he was enhancing these aspects, and, thus, making it into something more special--making it into art. 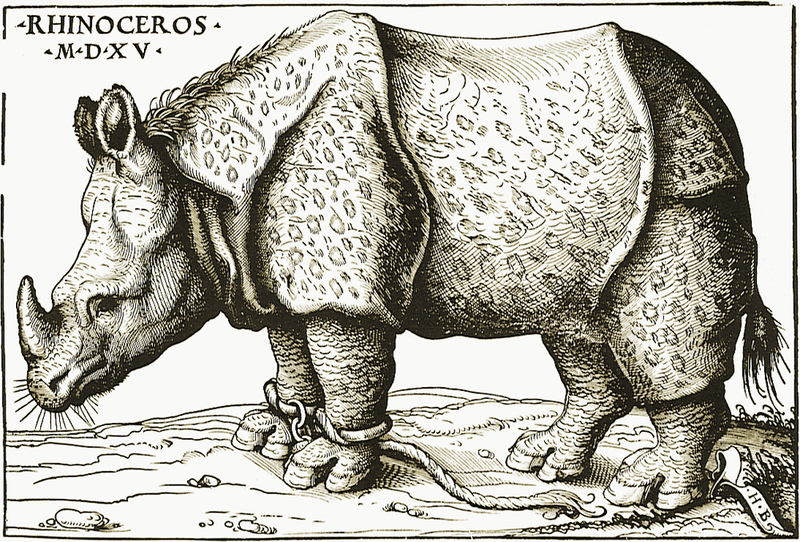 In summary, Dürer's rhinoceros reflects two central aspects of renaissance culture. One is rampant imperialism. The renaissance saw the emergence of powerful empires that vied for power within Europe and around the globe. These efforts raised awareness about distant lands, but also encouraged European exceptionalism. Foreign shores were seen as exotic, untamed, and inferior. The renaissance also introduced secular ideas about the function of art, and with these came a new focus on wondrous experiences. These two aspects are related. Expanding empires fed the emerging appetite for curiosities. 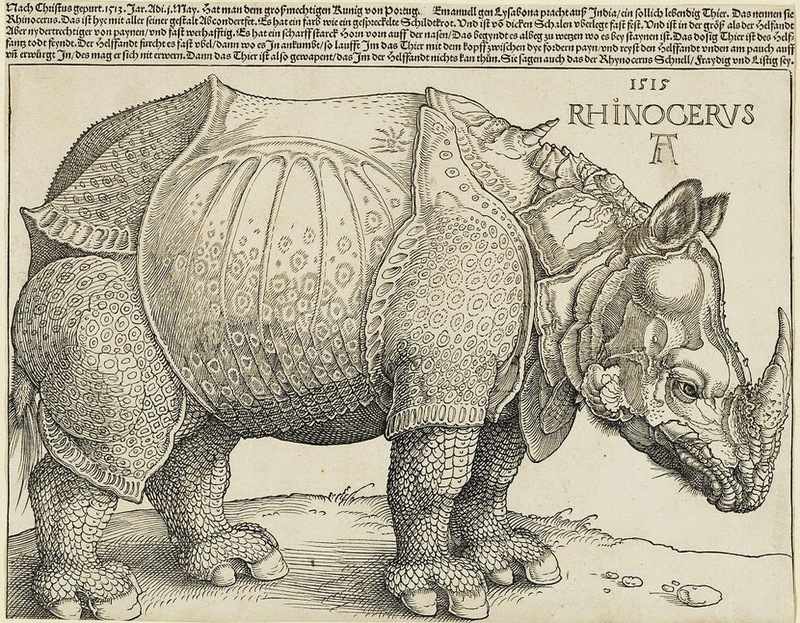 Both themes converge on the notion of the exotic, which Dürer exploits in his rendition of the rhinoceros. In the half millennium since its creation, much remains the same. 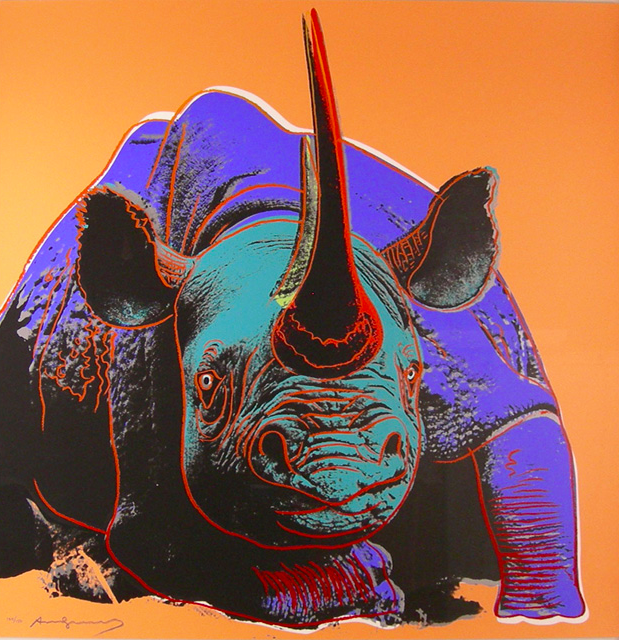 The rhino remains a symbol of the something alien, intriguing, even absurd (think Ionesco). Dürer's ambition to make art accessible to all has been largely fulfilled. As in his time, printing technologies allow ordinary people to decorate their homes with artworks, and cabinets of curiosity have evolved into a booming museum business. The imperialist dimensions of Dürer's image also remain in place. We also continue to present other cultures as exotic. The Western artworld has embraced "post-colonial" art, but we welcome non-Western artists into our museums only when their work resembles what we produce locally. Indeed, art itself is an instrument of imperialism, just as it was in Dürer's day when missionaries brought Christian iconography to the New World. Christian control of Europe collapsed shortly after Dürer's life time, but the cultural export business continued. The 1950 image above in by Nandalal Bose, a pioneer of Indian modernism; it pays homage to Dürer and reflects other sources of European influence. Western modernism could not have happened without the influence of Asian and African art, but those sources of inspiration were clouded by an exorcizing gaze, and now the West does more exporting than importing. These days, digital technologies help contemporary iconography reach every corner of the globe, advancing the hegemony of Western values. Technologies allow for new wonder shows that captivate audiences everywhere. Computers have become our digital cabinets of curiosity; they give us access to endless exotica. They also spread our visual culture more effortlessly than ever before. Renaissance masterpieces, Picasso, and Warhol are now universally recognizable, but few in the West can recognize masterworks form locations of colonial conquest. Colonialism is now on the wane, but this asymmetry remains. As museums go virtual, art remains an instrument of empire.